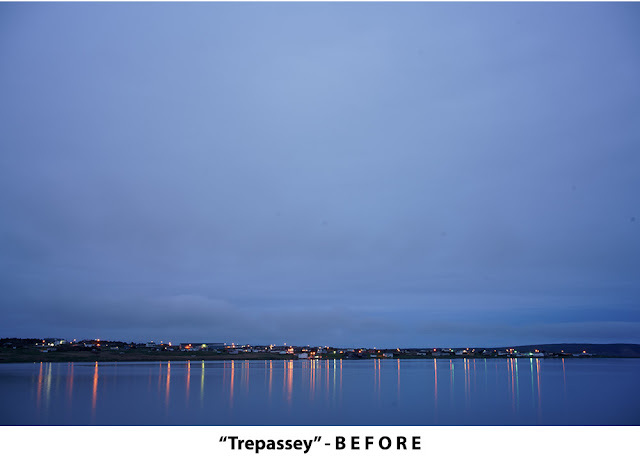 The isolated coastal village of Trepassey, Newfoundland sits in the southeast corner of Canada's eastern-most province. The vantage point of this photograph makes for a classic Newfoundland scene: a sliver of human settlement poised between sky and sea. Ethereal, other-worldly: I wanted to capture that feeling. Because I had pointed my camera slightly upward to get more sky in the frame, I had to correct the resulting perspective distortion - notice in the "before" image how the lines of reflected light closest to the sides of the image are twisted away from the center. I fixed the color temperature to eliminate the strong bluish cast. I corrected the vignetting - notice how the "before" image is significantly darker at all four edges. I cropped from the bottom of the image to bring the bottom border closer to edge of the reflected lights. How do you convey "ethereal"? For me the key elements were delicacy, lightness, and a sense of "un-reality". For delicacy, I tried to give the image a soft, gauzy look. I did part of this while taking the photo by opening the shutter for 20 seconds. This created the silky appearance of the water. I enhanced the effect in post-processing - for the water and the sky but not the strip of land - by dialing back the fine contrast setting in DxO PhotoLab. As for lightness, the challenge was that I was took the photo when most of the daylight was gone. The lights in the village were on and their reflections were easily visible. But the darkening sky created a leaden feeling that I eliminated through exposure and tone curve adjustments. Which brings me to the last point - "un-reality". 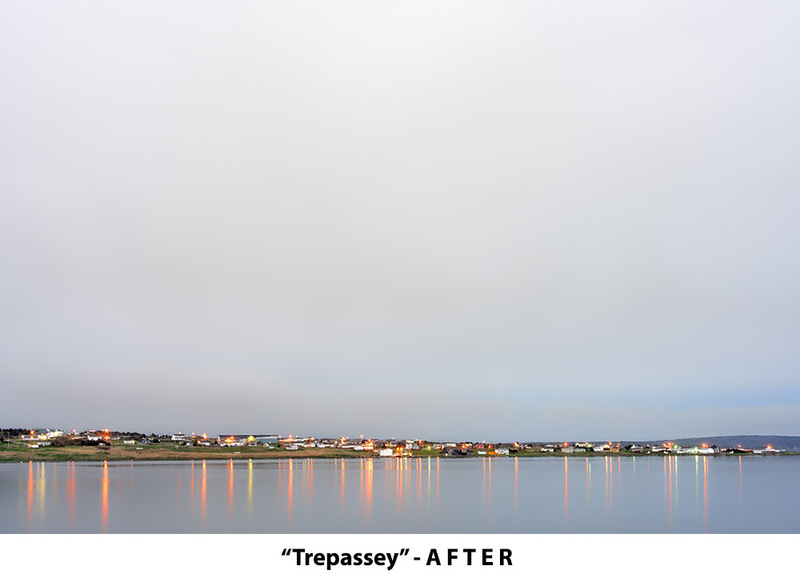 If it's a time of day when the village lights are on and are well reflected in the water, does it make sense that the sky should be as bright as it is in the "after" image? Probably not! It looks un-real. But to my eye the photograph works, which is all that matters.